Pico Tanks is a casual but competitive, team based multiplayer mobile shooter, focused on action-packed combat and rewarding team play. 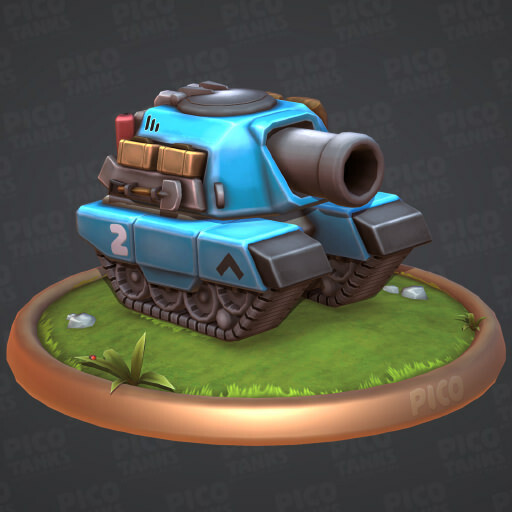 Pico Tanks will be free to download on the App Store and Google Play. Before entering a battle the player must build their tank with items unlocked and upgraded in the Research Tree. Each item in the Research Tree has a cost associated with it. Currency to unlock and upgrade items is earned by competing in battles, leveling up and completing challenges. 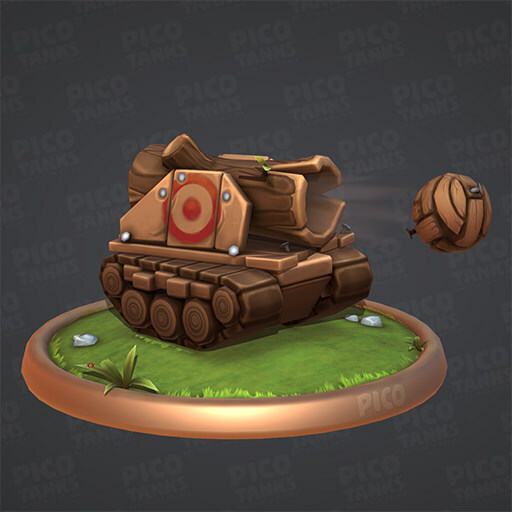 Players can also customize the appearance of their tank by adding tank toppers and antennas. After being matched with other players and entering a battle the player chooses a tank that best complements their team's composition. Players are rewarded for performing tasks crucial to their team's success in one of several game modes. Some of these tasks include; completing objectives, supporting team members, and destroy enemy tanks. A player’s tank consists of a base, weapon and abilities. We hope to start a closed beta in a few months and an open beta mid 2018. Post release we're are planning to add a survival mode where a solo player or team fights increasingly difficult waves of AI enemies, more content and possible release on console. Since Pico Tanks is multiplayer to sync the projectile across clients we send the projectiles initial position, velocity and launch time. When the message is received by another player we can fast forward the projectile to it's correct location. The noise function uses the projectiles network ID added to the projectiles lifetime to generate a random position, this way each projectiles movement is different but also deterministic. BIG fan of the look you've got here! Definitely keeping an eye out for this one. We're in the process of implementing and testing the 60 weapons and tank bases our artist has mocked up. 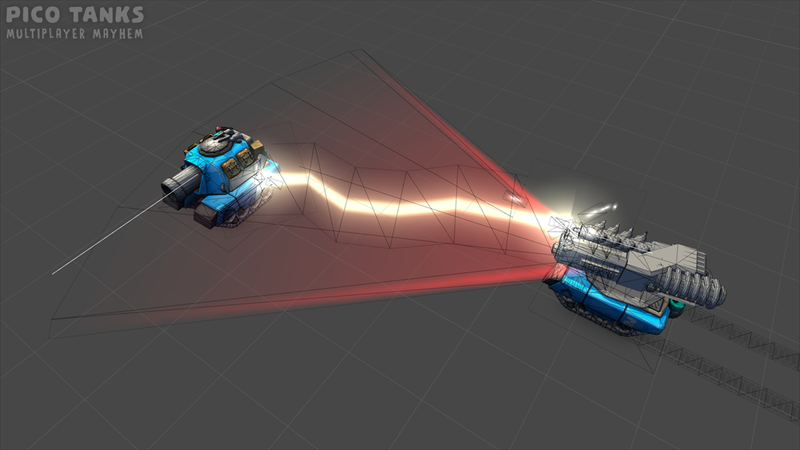 For the quad copter tank base we've added the ability to tilt the tank in the direction its moving. Checkout our tanks in 3D on Sketchfab! Had way to much fun implementing the Zapper gun! Are you using an off-the-shelve game engine for this? Or is it custom made? If the latter is the case: is it server-client based? Please don't make it pay-to-win! Really cool, it's exciting how well it will run online on mobile devices. Thanks Fridgecrisis Do you like it when we post models on Sketchfab? We're using Unity. We're a small team of 4 so a custom engine is not something we ever considered. Don't worry we wont make it pay to win it will be a free to play model though. 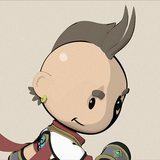 Players will be able to pay to accelerate their progress through the games unlocks. Unlocks that effect gameplay will all be balanced so that no one is more powerful than another. The further the player progresses the cooler and more specialised the unlocks will be but not more powerful. How does that sound? I'm not sure if you were asking about internet performance or device performance, so I'll answer both. We're constantly playing and testing on a mobile internet connection and it works great The game currently works great on older devices like the iPad Air 1 (released November 2013) although we haven't done extensive testing or performance optimisations yet. We'll also give options to run the game on lower settings to improve performance on older devices or to save battery. We'll sell things like chests and currency that can also be earned through regular play. Chests contain cosmetic items. Players will also be able to watch ads to accelerate unlocking items. We're also contemplating a premium subscription that provides early access to new content and acts as a XP and currency multiplier. If a player has played for a decent amount of time and hasn't made any IAP's then we may show them interstitial ads. Sound ok? We've made it so the Zapper arcs across multiple bad guys We'll probably make the damage, effective range and targets the arc will traverse upgradeable. Every Friday we spend a part of the day working on something fun. We put together some tools to help automate parts of our level authoring process. We already had a tool to create bezier curves, so today we put together some code to generate a forest inside of the polygon defined by the curve. We could place the trees by hand, but we have a visibility system in the game that hides players who enter a group of trees and we'd have to update that system every time we move the trees around. Now we just reshape the forest by modifying the bezier curve and the forests are updated along with the visibility manager. We have a fence generation tool that also works with a bezier curve. The fence segments and posts are instantiated along the curve at a set distance between each other, and the code that generates the fence 'wires up' every segment to its neighboring posts. This ensures that when the player destroys a post the segments connected to it break too. This would be pain to do by hand, so we've automated it too. Fun Friday task - Critters! I wanted to add sheep that the player can interact with but wont affect gameplay. If you ever tried to manipulate a physics driven object to move like a character you'll know that it can be a tricky task. In this case we are using physics to detect collisions but then handle the resulting movement ourselves. The critter basically wonder about until they collide and we use Unity's Physics.ComputePenetration to generate a vector that will de-penetrate our critter from whatever it is colliding with. Our tanks use a similar method. The stylization is great. The hand-painted look just makes this inviting. I also like the effects, it fits nicely with the style your going for. The flapping and bending of the toilet roll is all in the vertex shader and the toilet lid is a skinned mesh.